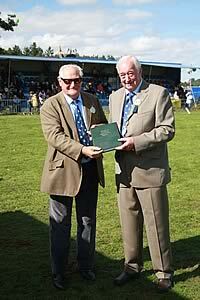 Yesterday, at the annual Glendale Show Mr Duncan Davidson who is standing down after 20 years as President of the Glendale Agricultural Society was presented by his successor Michael Walton with a single edition leather-bound history of The Glendale Agricultural Society. This bespoke book was compiled using information gathered from the Berwick Archives and the Society’s own archives. Duncan Davidson who is standing down after 20 years as President of the Glendale Agricultural Society is presented by his successor Michael Walton with a single edition leather-bound history of The Glendale Agricultural Society. The presentation underlines the exceptionally high regard the society holds for Mr. Davidson who has shown unwavering support for both the Glendale Show and the Society throughout his period of office. For the last twenty years both he and Lilburn Estates have given the society and the show unparalleled support, without which both the Glendale Show and The Glendale Agricultural Society would not be where they are today. The Estate annually gives the showfield and lends machines and manpower, they offer storage for equipment and support throughout the year for many of the Society’s events. “I have thoroughly enjoyed my 20 years as President of The Glendale Show. Having lived and raised my family in the area and built up a large farming enterprise around Wooler, I think it is essential that local farmers, horticulturalists, feed firms and machinery suppliers can all meet and show off their products. The show is a wonderful environment for all these people to meet and for the wider general public to see what our part of Glendale can produce. During his time as President of the Society, he has seen many changes. The Show and Society have moved forward to meet the needs of the 21st century and it has become one of the most progressive and highly acclaimed agricultural societies in the country. The show has continued to grow and a number of new attractions were introduced while Duncan was President including the Specialty Food Marquee; Demonstration Kitchen; Bandstand and world famous main ring acts including the Dancing Diggers. This legacy continues and this year for the first time, the Show has a dedicated Entertainment Marquee. Legislation has also played its part; the showfield has been transformed as health and safety regulations have an increasing part to play, and Defra regulations have also had a huge impact on the livestock section. The Society has also changed behind the scenes; Duncan has worked with 6 different Show Secretaries including Rachael Smith who currently holds this role. She is part of a permanent show team working from a dedicated office in Wooler. Under his Presidency, the Society has increased its annual calendar of events. A number of new awards and initiatives have been introduced. A Herd Competition acts as a showcase for the region’s renowned pedigree cattle and the New Enterprise Award, whose winner is announced at the show, highlights the wide range of innovative farm diversification projects in the area. The Children’s Countryside Day has drawn fantastic support from the Glendale Community and has educated thousands of children from rural and urban backgrounds about country life. Member events have increased and the Society holds quiz nights, social evenings, curling and stock judging events throughout the year. The Glendale Agricultural Society, still has at its heart the preservation of rural life but it has adapted to today’s needs. A website allows easy access to online schedules and application forms; a great deal of work has been done on promoting the society and its membership and part of its overall branding now includes its very own Society tie. Uplands Entry Level Stewardship – Is it worth it?